Syllabus of the Online Course (Subject): China-Singapore Free Trade Agreement (FTA). 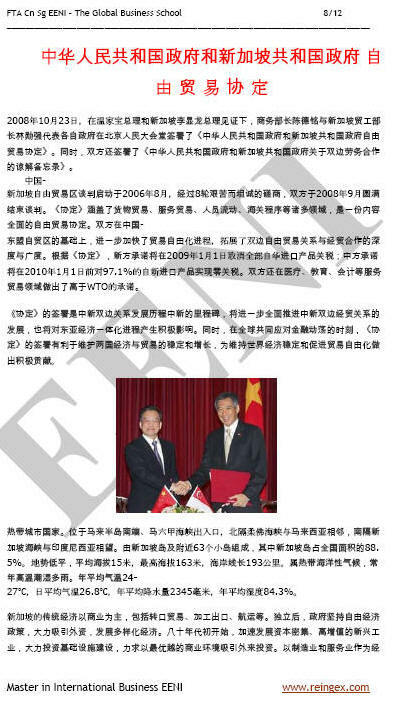 The China-Singapore Free Trade Agreement entered into force in 2009. 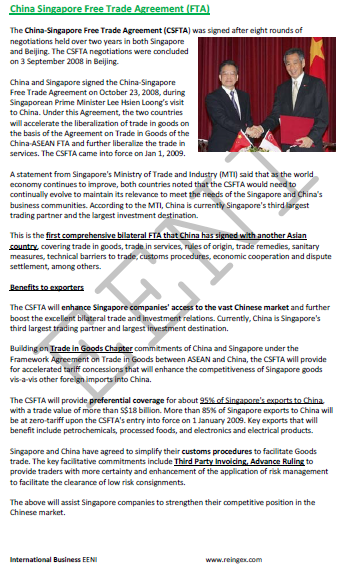 Under the Free Trade Agreement (FTA), China and Singapore will speed up Foreign Trade Liberalisation in products on the basis of the Agreement on trade in products of the China-ASEAN Agreement and liberalise bilateral trade in services. The People's Republic of China is the third largest trade partner and largest foreign direct investment (FDI) destination of Singapore. The China-Singapore Free Trade Agreement (FTA) operates within the Buddhist Civilisation.